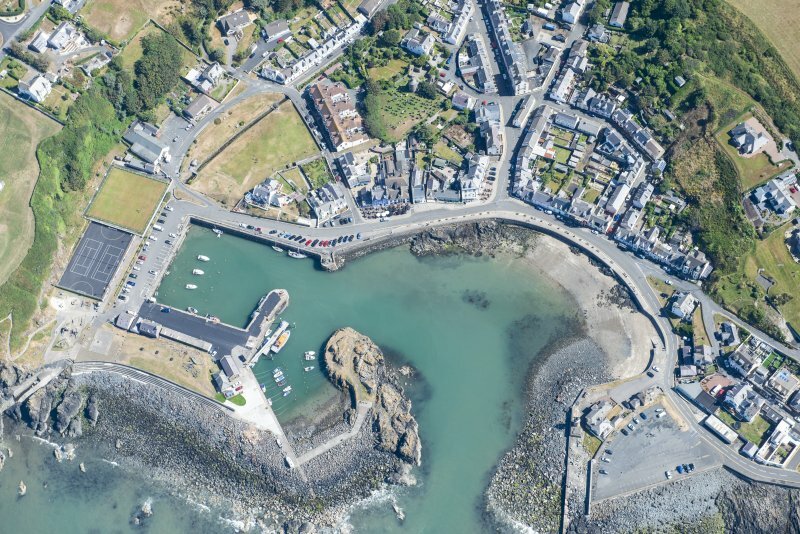 General oblique aerial view of Portpatrick Harbour, taken from the SSE. 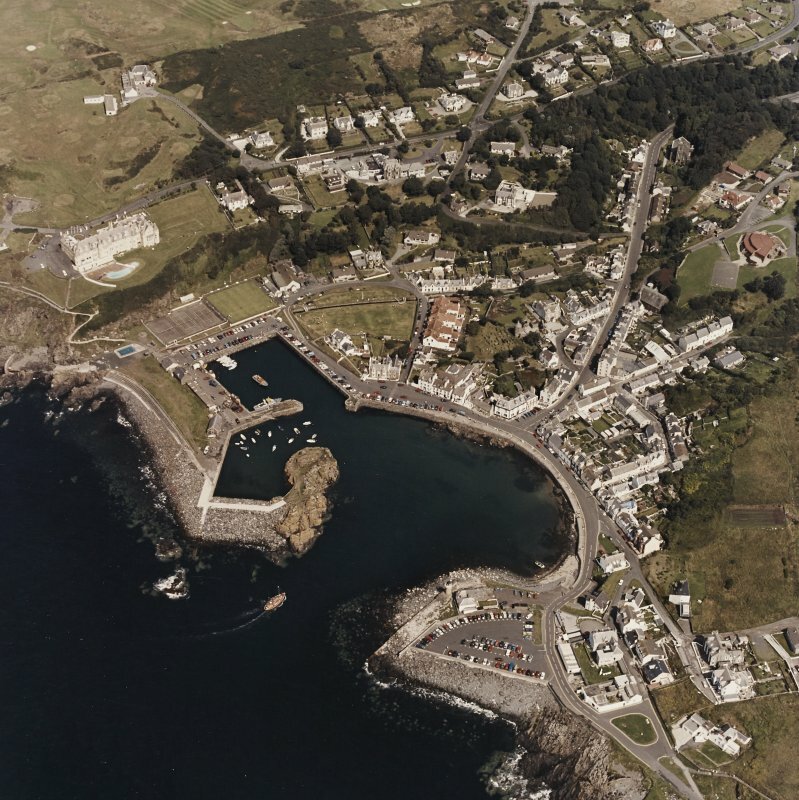 For (nearby and competitor) Port Logan harbour (NX 09470 40565), see NX04SE 15.00. For associated quarry (centred NX 00045 53682), see NX05SW 80. Building a harbour. Letters patent granted the inhabitants of Portpatrick and Donaghady a voluntary contribution for building a harbour at Portpatrick. 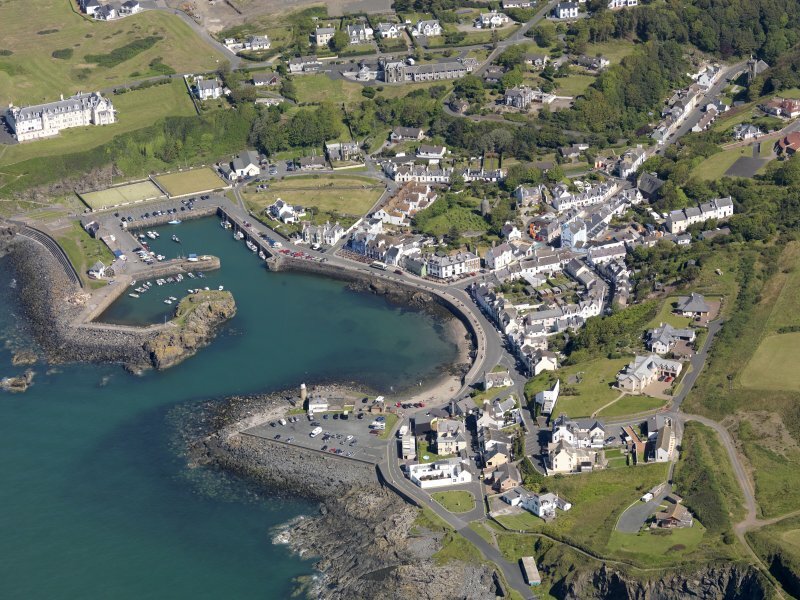 Portpatrick is significant as one of the few breaks in the SW-facing coast of the Rhinns which are suitable for the construction of a harbour. The conveyance of passengers and cargo to Ireland was noted by 1620, a regular weekly mail service being established in 1662. Vessels lay offshore to discharge. In 1774, a pier was erected on the S side of the inlet at the dictate, if not the expense, of the Post Office, which assumed responsibility for running the service in 1790; sailing packets were provided by the government. Cattle and horses landed at Portpatrick numbered 17, 275 in 1790, this figure rising to 20,000 by 1812. Passenger traffic was brisk and included the transport of troops; barracks and a large custom house were built. By 1819, the government was sufficiently interested in the port to seek the improvement of its facilities. The distinguished engineer Sir John Rennie reported favourably on the Portpatrick-Donaghadee route, and drew up plans for an enlarged harbour. There were approved, and he started work in 1821. Following his death, in the same year, his son (also Sir John Rennie) assumed responsibility for the project. The general plan was that of two piers extending out from the shore and curving towards each other to give an entrance some 200ft [61m] across. The S pier incorporated the older one of 1774, and was built grey Welsh limestone; at its extremity there was a lighthouse 46ft [14m] high. At first, the project proceeded rapidly; between 700 and 800 men were engaged and work continued at night. Work later slowed, and it was 1836 before even the S pier was completed. In 1839, an exceptional storm damaged the pier and endangered the lighthouse; £13,000 was spent on repairs and construction work stood still for some time. The harbour was so designed that sailing vessels could warp themselves out in any conceivable conditions, but no change was apparently made when steam packets were introduced, in 1825. The size of the mail traffic was considerable. In 1838, it was recorded that between 8000 and 10,000 letters a day were passing through Portpatrick. By contrast, animal traffic was diminishing as steamship sailings became more frequent between from Belfast to Glasgow and Liverpool. 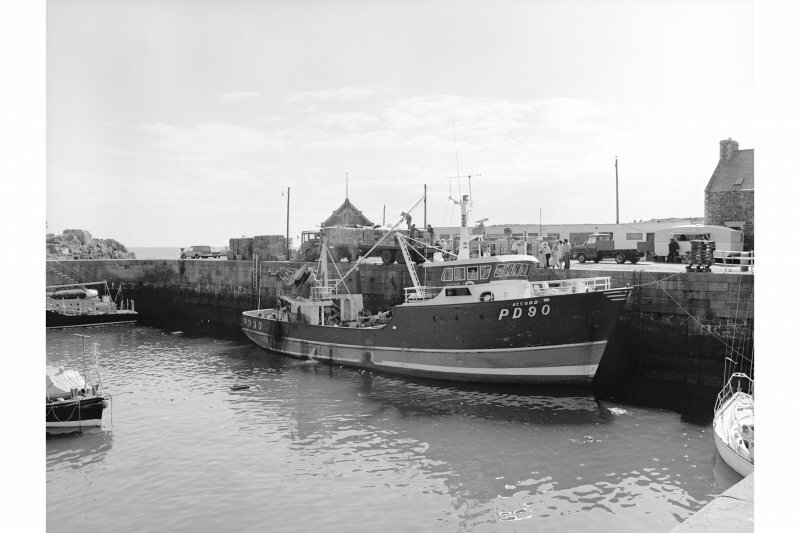 Interest in Portpatrick waned at this period as Cairnryan [name: NX 06 68] became seen as a more attractive port. In 1847, supervision of the Portpatrick-Donaghadee [Co. Down] service and its two terminal ports was entrusted to the Admiralty. A mail service to Ireland via (rail-served) Holyhead and Kingstown was inaugurated in 1848, and the mail service between Portpatrick and Donaghadee was withdrawn on 30 September 1849. In 1856, the Government reconsidered the matter of the Portpatrick ferry service in the context of the proposed construction (from Castle Douglas) of the Portpatrick Rly. A treasury minute of 15 August noted that the Admiralty favoured use of the Portpatrick-Donaghadee route, agreeing to improve the harbours if a steamship service were established by private enterprise. 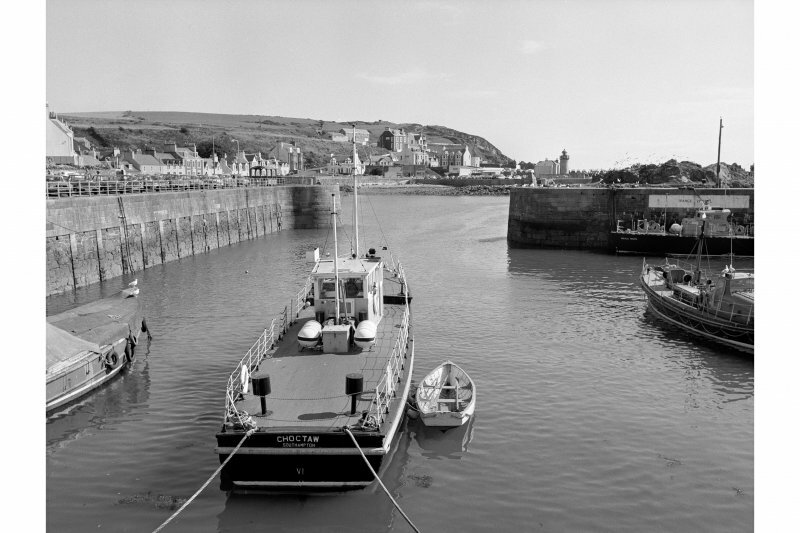 The Government agreed to proceed with the improvement of Portpatrick harbour as soon as the railway Bill was passed. The contract for the construction of the portion of the line from Castle Douglas to Stranraer was let in March 1859, but no action was taken regarding the connection to Portpatrick. 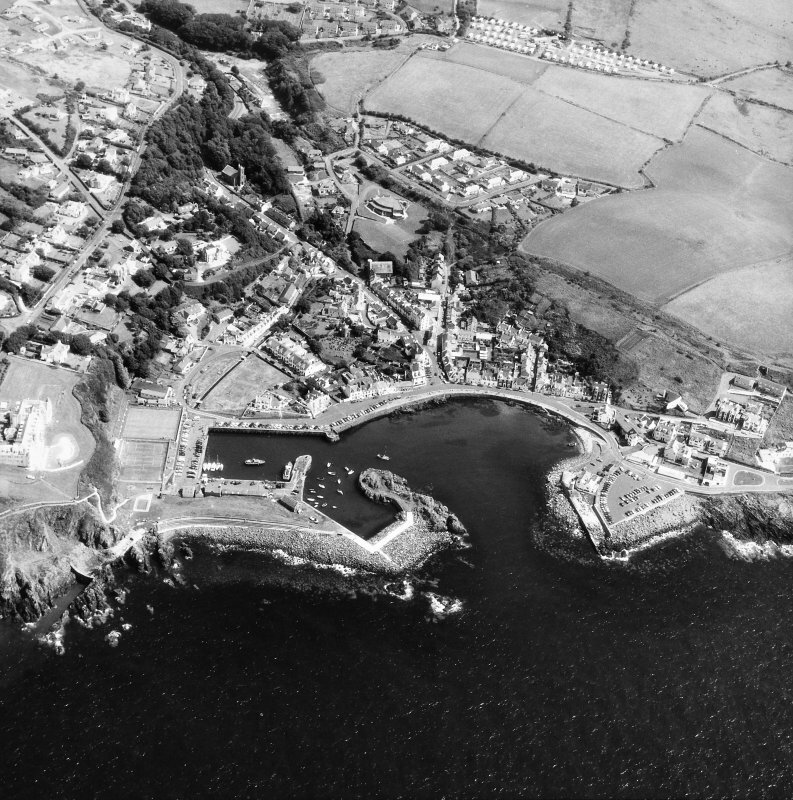 The Treasury continued to favour the use of Portpatrick, and the Portpatrick Rly agreed to complete construction to Portpatrick harbour within five years of the passing of the Act (1857). Construction started in 1858, and in 1859 a Treasury grant of £20,400 was forthcoming. Two schemes are recorded as arriving in Portpatrick Harbour on 8 March 1860 with railway construction materials for contractor Thomas Nelson. Work proceeded on the construction of the branch, but Nelson's contract was not confirmed until 28 March 1860. In July, came the loss of the expected £40,000 from the Glasgow and South Western Rly, placing the whole scheme in danger of cancellation. Work on the harbour branch stopped at the end of the year as the directors were beginning to have doubts, largely on account of the steep gradient (1-in-35) down to the harbour. It was anticipated that only passengers and light goods could be handled. The Admiralty then applied for permission to close the harbour to shipping pervading improvements. The Duke of Somerset moved the second reading of the Bill in the House of Lords on 27 June 1861, stating that work had begun in March and would be completed within two years. The new dock would be 206ft [62.8m] square and 30ft [9.1m] deep. A minimum depth of water of 10ft [3m] would be maintained, so that vessels of the type likely to be used in postal service, and with a length of 150ft [45.7m] would be able to enter and leave at any stage of the tide. Little progress was apparently made with the harbour works in 1861, but a reporter observed seventy men at work within the basin on 28 June 1862, the contractor being Mr Greenhill. Part of the works involved blasting away part of an intrusive outcrop, while a small steam engine drew wagons up an inclined plane from the dock and powered a pump to keep the dock dry. The contract for widening the entrance had been placed separately, but no further steps had been taken to carry out this work. The Stranraer-Portpatrick portion of the Portpatrick Rly opened without ceremony on 28 August 1862. There was, however, no corresponding ferry service at the harbour. Meanwhile, further Irish agitation was in progress. It was noted that Irish parties had subscribed £29,000 to the Portpatrick Rly against the prospect of a short sea passage via Donaghadee and Portpatrick. Harbour improvements were almost completed at Donaghadee, whence there was direct rail communication to Belfast. There was strong suspicion in Ireland that the Donaghadee-Portpatrick route was to be abandoned in favour of Stranraer-Larne. The possible resumption of a mail service from Portpatrick was considered in 1863, and in 1864 the Portpatrick Rly gained the power to acquire steamships for use on the route. In the same year, the Caledonian Rly took over operation of the Portpatrick Rly for a period of 21 years, and the Board of Trade reported work on 'the basin' would be completed in May or June. Work apparently ended in 1865, in which year abandonment of the Donaghadee-Portpatrick route was contemplated on withdrawal of the subsidy. 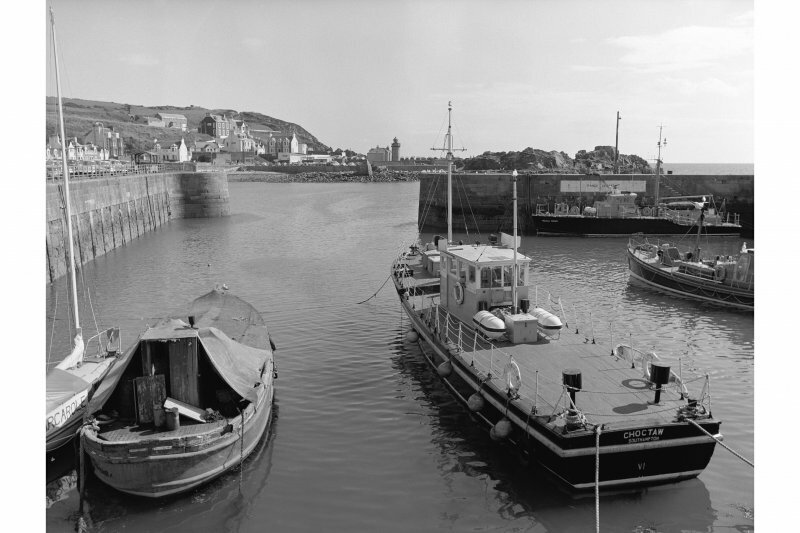 The Government proposed to transfer Portpatrick harbour to the Portpatrick Rly, and to pay them £25,000 by way of compensation. The Portpatrick Rly then instituted a steamship service which operated until 1868; further short-lived revivals of the service took place in 1871 and 1873. In the latter year, the Harbour Acts were repealed, the present ruinous state of the outer harbour being achieved soon thereafter. The harbour branch was opened in 1875. (Location cited as NW 998 542). 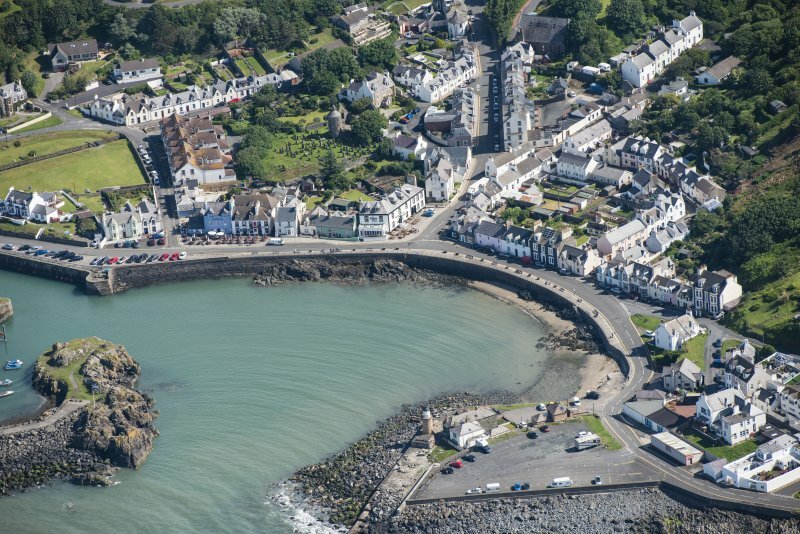 Portpatrick Harbour: dates in its present form largely from 1820-36. Engineer John Rennie. 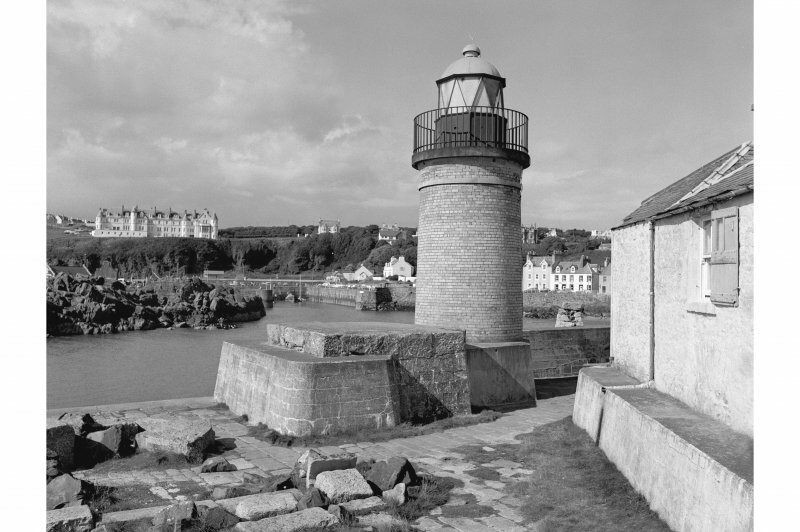 The harbour was designed to have two massive projecting piers, but only the S pier, with a circular brick lighthouse, was completed. Behind the remains of the N pier and a natural rock barrier is a rectangular basin, improved 1857-63. 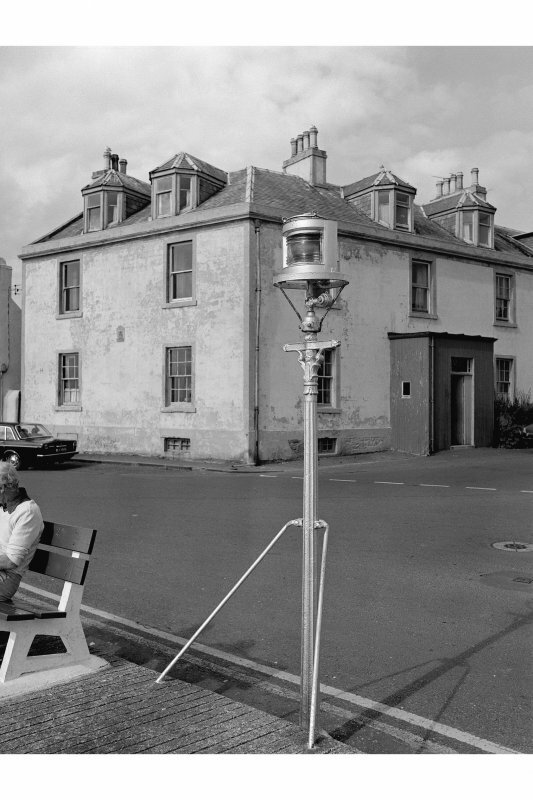 An interesting minor feature is a navigation light fixed to an ordinary cast-iron lamp standard on the E side of the harbour. (Location cited as NW 99 54). Portpatrick. 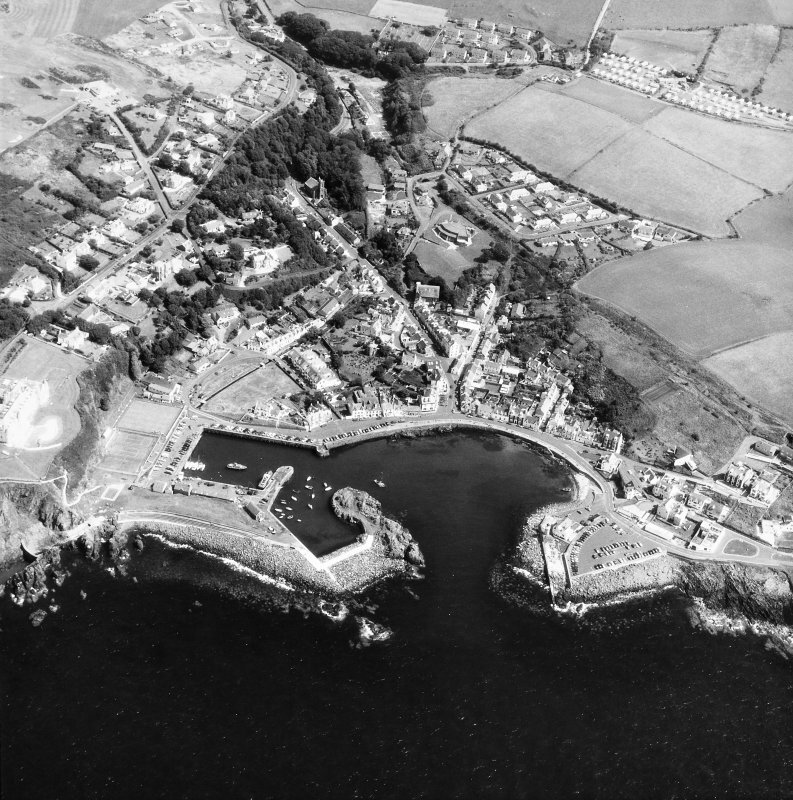 In virtue of a tradition preserved in the Book of Leinster, W J Watson identifies the place named in it as Port Rig (Portree) with the later Portpatrick, connecting 'Rig' with Reregonium, which he regards as the royal town of the Novantae and places in this region. He would thus carry Portpatrick's history back to the first century of our era, while he dates a rather later reference to about AD 250. To come down to more recent times, the port was described in evidence given to the Tidal Harbours Commissioners in 1846 as a very old and favourite packet-station, to which mails had been brought from Ireland in smacks 'from a very remote period'; and in the 16th and 17th centuries several allusions are made to the port and its affairs in the Registers of the Great Seal and of the Privy Council. For example, in 1573/4 it was described as the port of Dunskey Castle (NX05SW 3), and in 1624 it was included in a list of the 'most frequented portis' for the transport of goods to Ireland. Sir W Brereton describes how he crossed to Ireland, with his horses, in a charted boat in 1636, while W Symson, writing in 1684, calls Portpatrick 'the ordinary port where barks come in with passengers from Ireland'. In respect of the mid-18th century, Roy's Map tells a similar story, as it marks the course and distance to Donaghadee [Co. Down], the corresponding Irish terminal. 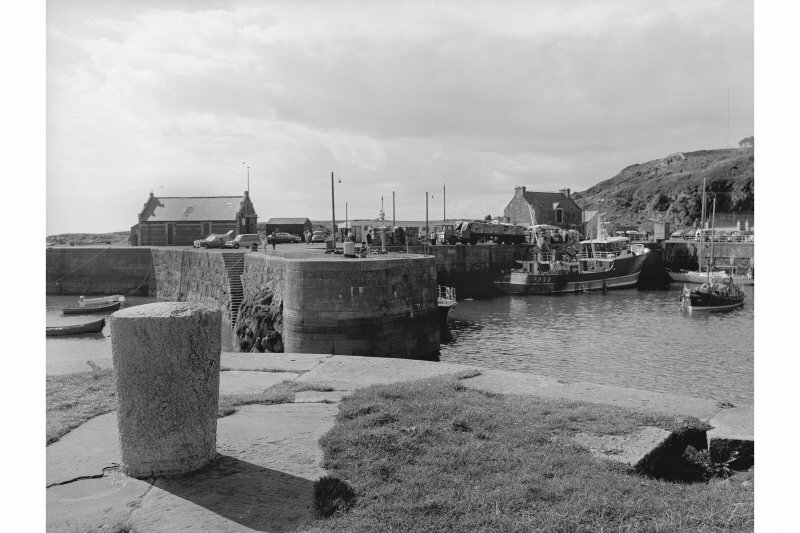 In addition to the ordinary functions of a local harbour, Portpatrick, in its heyday, performed two others, of wider general importance, as it became the base for the official packet-service to Ireland and the principal place of entry for Irish cattle. In respect of the former, a regular mail by Portpatrick had been started in 1662; 1825 should be noted as a crucial date when the Post Office first introduced steamboats. 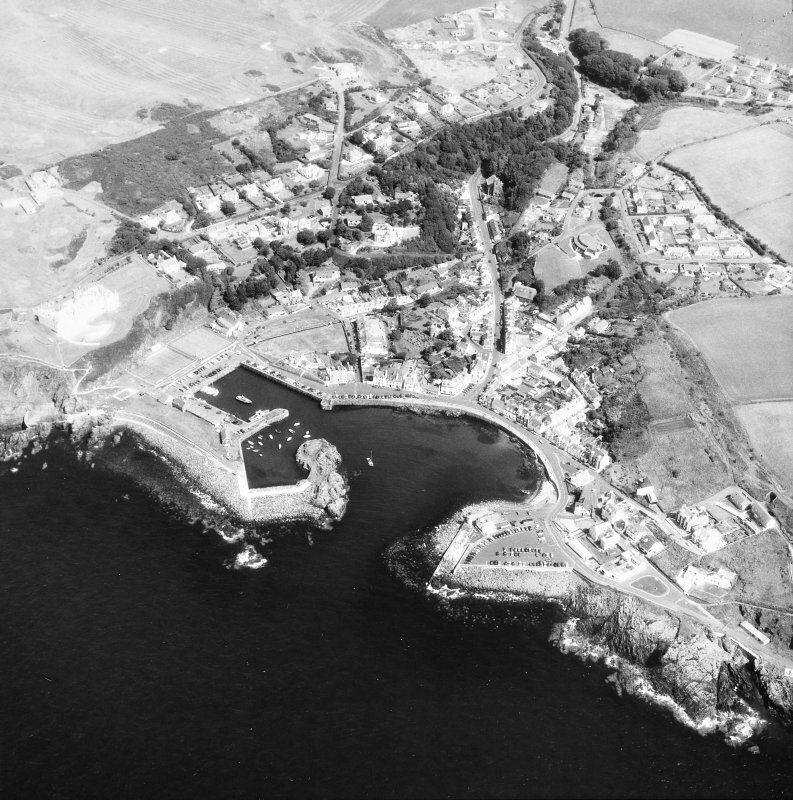 Portpatrick's connection with the mail-service ended soon after this study's terminal date , but a note on some later developments may be added. As regards the importation of Irish cattle, permission to land cattle at Portpatrick was granted as early as 1627, and the trade was carried on in later years in spite of restrictions designed to protect the interests of the local Galloway farmers. The ban on importation was finally withdrawn in 1765, at which date Portpatrick possessed six vessels mainly engaged in the importation of cattle; between 1786 and 1790 over 55,000 head came in, and in 1812 alone no less than 20,000. An end, however, was shortly put to this boom when steamers began to carry cattle from Ireland direct to Liverpool and Glasgow; and by 1837 Portpatrick's figure had decreased to 1080 only. These and other similar strictures derived from unfavourable natural conditions combined with an unfortunate history. In its natural state, the harbour must have consisted of a rock-bound inlet, fully exposed to the prevailing SW winds and customary storms, and complicated by a treacherous bar. Its head was formed by a more or less kidney-shaped bay, with its shoreline curving from NNW to S, and its NW portion enclosing a rocky islet known as McCook's Craig. The bar and rocks at the entrance did nothing to modify the headlong inrush of the seas, and in fact the site possessed no virtues to make up for its inherent defects. These defects are clearly shown up by the ruinous remains of the works designed to overcome them. 3.	the pier, with a nearly vertical W face, a rounded N end, a parapet-wall, perhaps about 9ft [2.7m] high, running along its centre, and a quay or walkway on either side of the wall and turning round its N end. The W face of the pier shows damage near its S end, and the parapet-wall is breached at a corresponding point. The pier is at a lower level than the quay. The picture represents conditions as at low tide, and shows a tongue of rock running southwards from the S end of the pier, and a beach beyond it to the SE. These arrangements having proved unsatisfactory, T Telford was commissioned to investigate the whole subject of suitable harbours on both sides of the North Channel. Visiting Portpatrick in 1802, he made an unfavourable report, noting the lack of landmarks visible from the offing, the presence of rocks which made entry to the harbour difficult, and the heavy swell set up by winds blowing from most directions. J Rennie was next called in; he likewise surveyed the possible sites between 1814 and 1818, and recommended the adoption of the route from Portpatrick to Donaghadee. 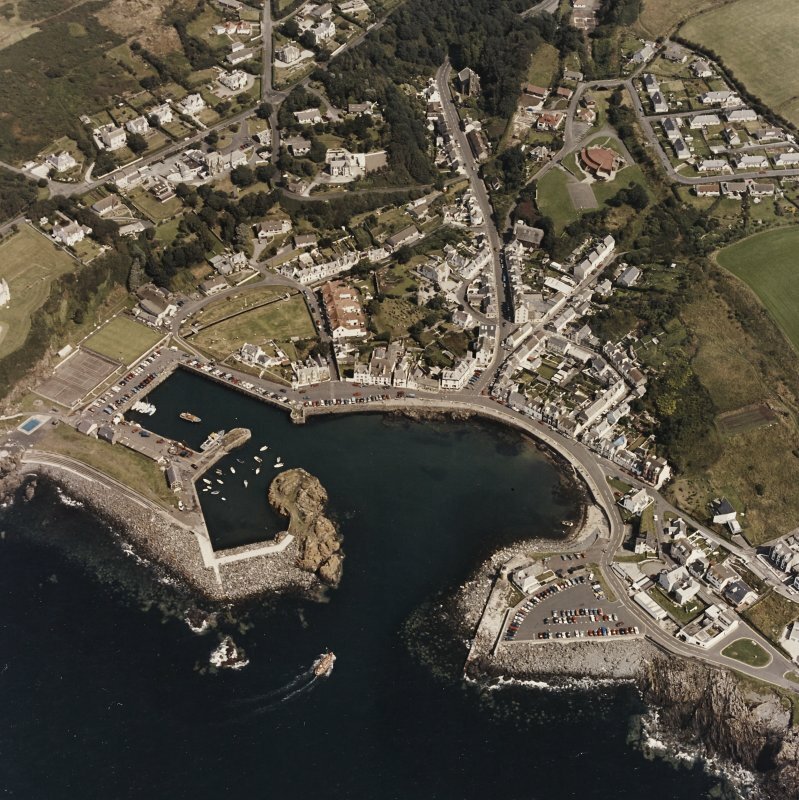 The possible use of Port Nessock Bay (Port Logan: NX04SE 15.00 NX 09470 40565) was considered as an alternative packet-station, but Portpatrick was duly chosen, and work started there in 1820. The subsequent course of events is again described by J Finlay in his evidence. 'In 1820', he states, 'the new works were begun by running out the south pier in a SW1/2W direction, with a jetty projecting at right-angles to the NW. 75 feet [22.9m]. The sea-slope of the south pier extends up to the top of the parapet-wall and was built at first with a slope of less than 1 in 1; all that part most exposed at the pier-head was washed away to the southward and filled up the angle. Till within the last 2 years a constant breaching of the glacis has been going on, from the outer point where the circular head springs, but the sea now appears to have formed its own slope. The stones laid down in the angle of the south pier were lifted by the sea, and served as battering-rams to breach the pier. The inner quay-walls have a batter of 10feet [3m] in a height of 30 feet [9.1m]' The light-house was built in 1834, and lighted till the heavy gale of 7th of January 1839, since when it has remained unlighted, owing to the difficulty of access to it in heavy weather'. In further evidence he states 'The works of the north pier were carried on at the same time' The foundations on the circular head of the north pier' were brought up to within 10 feet [3m] of the level of low water and the jetty that projects at right angles to the same level, and so they now remain. The south pier jetty was finished in October 1831, the south pier in 1832 and was breached by the hurricane of 7th January 1839; the width between the pier-heads is 270 feet [82.3m]; if the works were completed the width of the entrance between the jetty-ends would be 170 feet [51.8m].' In addition, the plan of 1835 shows a breakwater closing the channel between McCook's Craig and the land immediately to the west, which, with the Craig, protected another small pocket, the North Harbour. The plan of 1839 shows the North Pier with its outer end unfinished; the Old Pier with a rounded end partially encircled by a wall and with a quay on its inner side; a light-house, as today, and a parapet-wall flanking the SE side and encircling the rounded portion. Outside the pier on the south-east there is a flared basal belt, the rest of the angular space between this belt and the adjoining rocks being filled with the large stones mentioned in Finlay's evidence. Work on the North Pier stopped for financial reasons after the exceptional storm-damage of 1839, and its unfinished remains, together with uncleared debris from a coffer-dam on the inner side of the South Pier, created additional hazards. The evidence given in 1846 leaves one deeply impressed by the destructive power of the sea - perhaps underestimated by those in charge of these works. A particularly remarkable instance was provided by a block of whinstone weighing 17 tons, which was set in the sea-face of the South Pier and moved when the pier was breached in 1839. It may be mentioned in passing that the stone used in this construction was quarried from coastal rock about 300 yards [274.4m] S of the Old Harbour [quarries: NX05SW 80], but had to be finished in workshops situated NW of the town; a tramway was built for its transport along the harbour frontage. The foregoing passages may probably present a fair picture of the harbour at the terminal date  of this study, but in order to tie history to physical remains a few words are needed on the later course of events. The major points have been noted by R R Cunningham, and his account may be summarised as follows. In 1848 the Admiralty, which had taken over the ferry-service from the Post Office in 1837, withdrew the mail-steamers, for which, as they increased in size, the harbour had become increasingly unsuitable, and let the mail contract to a firm which worked between Glasgow and Belfast. The ferry continued to be operated by local craft. 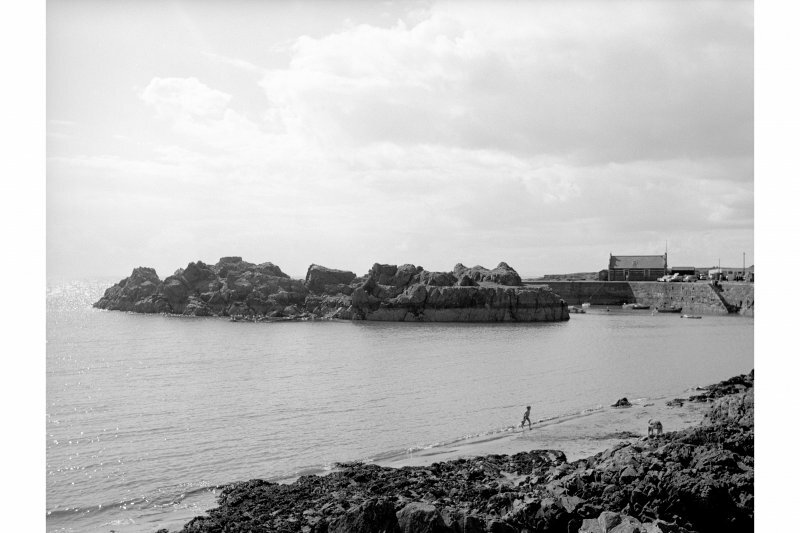 In 1857, however, a railway company was formed to serve Portpatrick, on the understanding that that the mail service should be restarted and an entirely new dock built to accommodate the steamers. Work on dock and railway was started in 1859, but the new basin [Inner Harbour: NW95SE 9.02} was not finished until 1865, and by that time the Stranraer-Larne route had come into use, with the collaboration of the railway, and the service from Portpatrick was consequently not restored. In 1868 Government support for the ferry service was withdrawn, and in 1873 the Harbour Acts were repealed and the harbour abandoned. Meanwhile in 1871, the lighthouse had been removed from the end of the South Pier, to be re-erected on the breakwater at Colombo; after its removal, the one on the inner end of the pier was relighted and continued in use until 1900, when its seaward side was shuttered and the landward light used to illuminate the harbour and adjoining streets. 7.	footings of other structures near these same ruins, for which no explanation is suggested. A Graham 1979 (visited 1978). In 1821 work was begun on a new harbour designed by John Rennie. His scheme was for a U-plan harbour with north and south piers, each with a lighthouse, running out from the shore, the end of the north pier being joined by a breakwater to the rock of McCook's Craig. McCook's Craig is not noted on the current edition of the OS 1:2500 map. The epoch 3 (GIS) map applies the name to the irregular exposure of rock around NW 99823 54056. Information from RCAHMS (RJCM), 14 March 2006. 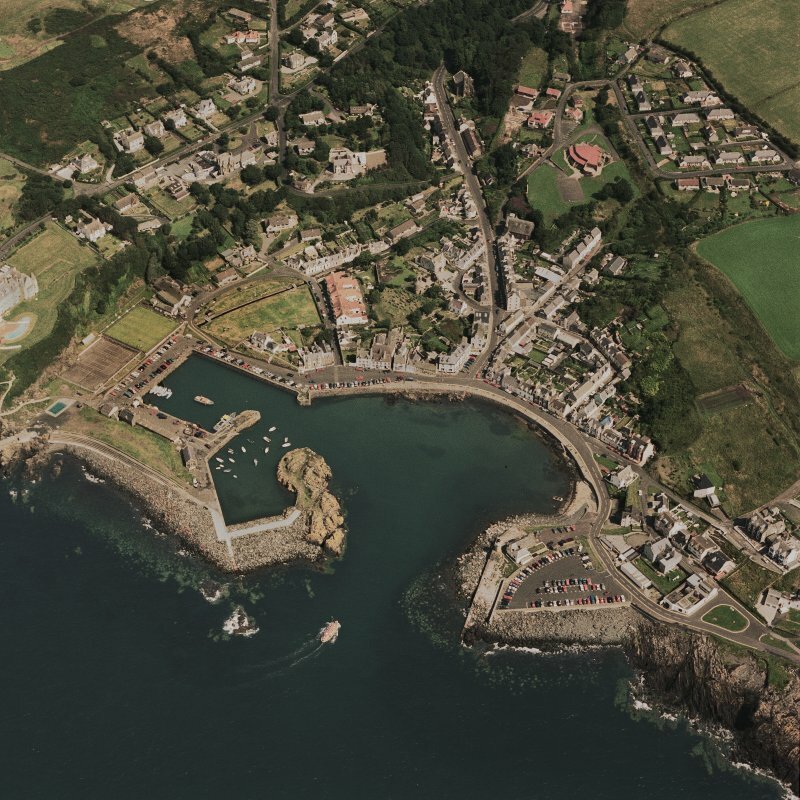 Portpatrick to Donaghadee was a trade route between Scotland and Ireland from earliest times and there have been several attempts to construct a substantial harbour. In 1768 John Smeaton proposed two breakwaters, north and south, the latter being completed in 1778. Efforts to build the north breakwater proved abortive due to the destructive action of the sea and finally abandoned in 1801. 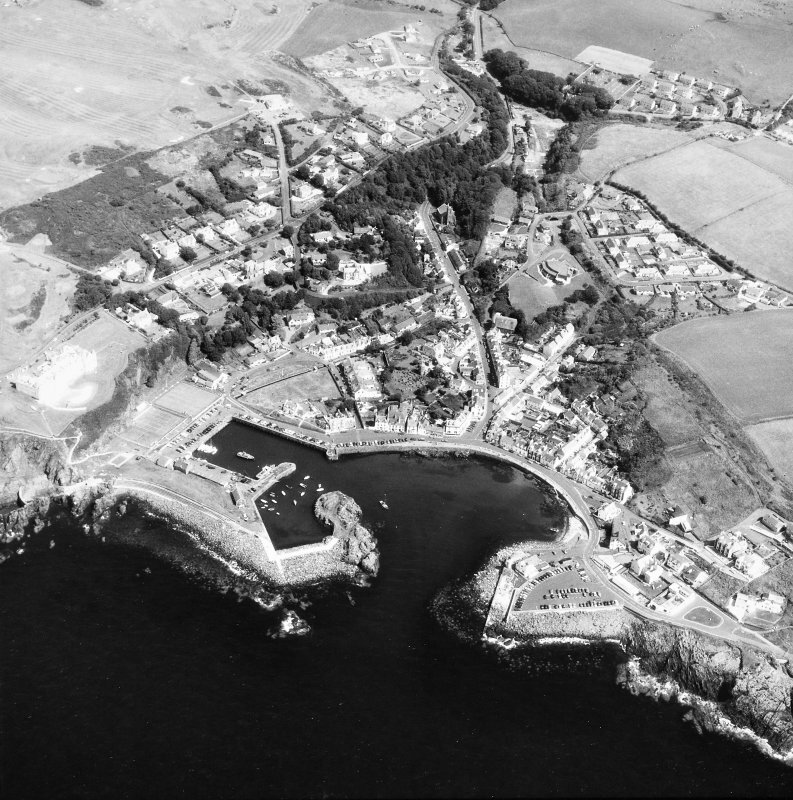 Telford was consulted in 1802 and found Portpatrick ‘destitute of the advantages requisite for a perfect harbour’, an opinion which was borne out by events. 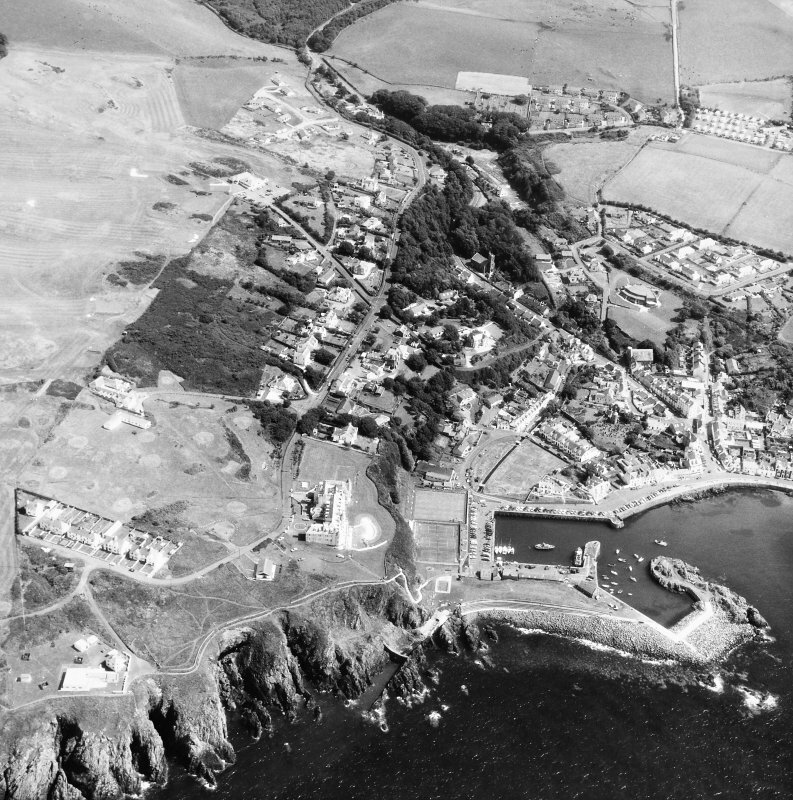 Rennie was of the opinion that a satisfactory harbour could be made and, in 1818, produced a plan modelled on Smeaton’s for two massive piers and a lighthouse estimated to cost about £120 000. Two years later work began. An eye witness ‘saw 700–800 labourers digging, quarrying, trundling barrows and building by night and day in the light of blazing coals heaped up in cradle grates. He saw too the thousands of tons of Dumbartonshire freestone, Anglesey limestone, local whinstone and granite which was used in constructing breakwaters and piers. While work proceeded the din of the ocean was stilled by the clang of hammers, the suction of pumps, the hissing of boilers and the roar of Bellows.’ The south breakwater with its lighthouse was eventually completed in 1836, but the north pier was unfinished. In 1839 a storm undermined the end of the south pier, endangering the lighthouse and causing £13 800 worth of damage, by which time costs on the project had exceeded £170 000. In 1849, when the Irish mail service was transferred to Stranraer, the extent of the harbour was as shown. 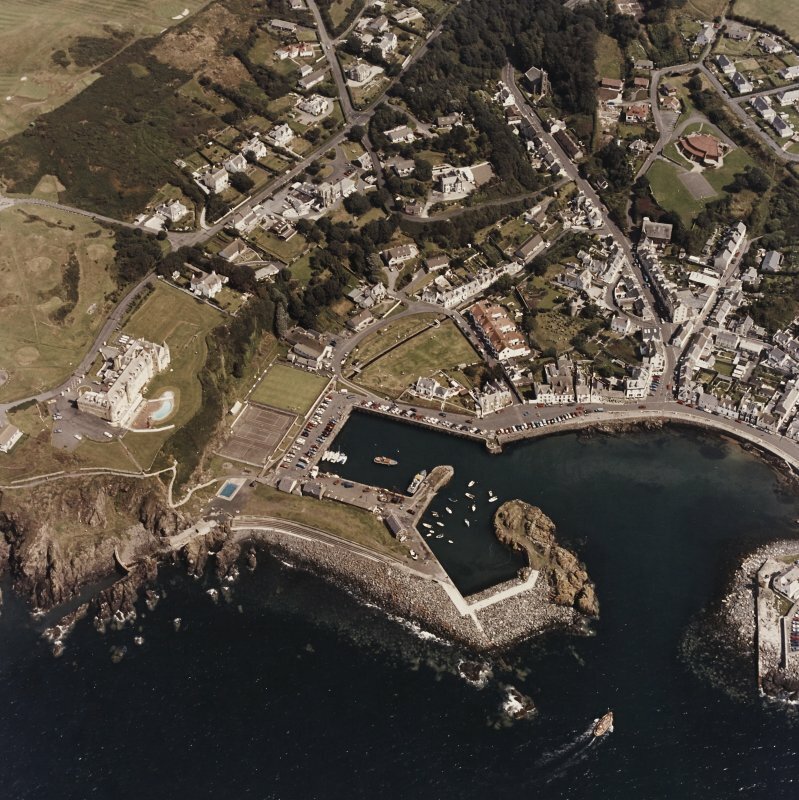 After the Portpatrick Railway Act was passed in 1857, an inner basin was excavated to the north of North Harbour, mainly in rock, to accommodate Irish Packet traffic. The railway arrived in August 1862 but the mail service never fully resumed at Portpatrick and after 1873 the harbour was abandoned. The lighthouse, redundant by the 1860s, was dismantled and re-erected at Colombo, Ceylon, now Sri Lanka, in 1871. The inner harbour is now privately owned and managed, and well used by fishing and pleasure boats. In 1901 details of a proposed alternative means of communication via an Irish Channel Tunnel were put forward by engineers Sir Douglas Fox and James Barton. They favoured the northernmost of three lines examined, involving a £10 million, 351/2 mile tunnel from Stranraer to Carrickfergus, of which 25 miles would have been under the sea. The project was considered practicable but funding was not forthcoming. Reproduced from 'Civil Engineering Scotland - Lowlands and Borders' with kind permission from Thomas Telford Publishers.